The No. 15/15 Quinnipiac Bobcats ended a four game ECAC losing streak on Saturday night with a 4-2 victory on the road against the Dartmouth Big Green. It was a rebound performance by the Bobcats after self destructing in the second period of Friday night's game against Harvard. Quinnipiac needed to get points in the ECAC in order to maintain a spot in the top four and did just so with the win. Head coach Rand Pecknold turned to freshman Andrew Shortridge for the start in goal tonight which was his first start since November 26th in a game against Vermont in Belfast, Northern Ireland. In the first period the teams played pretty even with each team trading penalties. Quinnipiac broke through for the games first goal late in the first period when Alex Whelan put a wrist shot past Devin Buffalo short side from the bottom left circle for his first collegiate goal. Tommy Schutt and Derek Smith assisted on Whelan's goal. The Bobcats out shot the Big Green 10-7 in the opening frame. In the second period, the Bobcats got on the board again just 37 seconds into the period on a counter two on one rush from a goal by Kevin Duane. It was Duane's fourth goal of the season to give Quinnipiac a 2-0 lead. The big power forward now has points in seven of his last eight games and has been one of the better Bobcats forwards in the past month. Landon Smith and Craig Martin assisted on the goal. Late in the second period, Shortridge made a huge save going from right to left to preserve a two goal lead heading into the intermission. The freshman had a big period making a few big saves to keep the lead in tact. Dartmouth out shot Quinnipiac in the middle frame 15-10 yet still trailed in the game 2-0. Quinnipiac struck again early in third period just 38 seconds in on a power play goal from Craig Martin who tipped Brogan Rafferty's wrist shot from the point past Devin Buffalo. K.J. Tiefenwerth also got an assist on the Martin goal which was his seventh of the season. Dartmouth got on the scoreboard at the 10:47 mark of the period on Cam Strong's seventh goal of the season on a breakaway opportunity that was set up from a Cameron Roth pass that split two Quinnipiac defenders. Quinnipiac took a 4-1 lead on an empty net goal from Kevin McKernan on assists by Craig Martin and K.J. Tiefenwerth. The Big Green had a late power play opportunity that they capitalized on with 11 seconds left in the game on a goal by Troy Crema that was assisted by Alex Jasiek and Grant Opperman. Dartmouth out shot the Bobcats 17-9 in the final frame and 39-29 for the game. Andrew Shortridge finished with 37 saves for the Bobcats in what was his best performance of the season in between the pipes. Craig Martin had a big night with a goal and two assists and K.J. Tiefenwerth had two assists. It was great to see freshman Alex Whelan get his first goal as he has been putting in a great effort each night and was finally rewarded for his play. With the win the Bobcats improve to 12-9-2 on the season and 7-5-1 in ECAC play and share third place with the Harvard Crimson. They also finished the night 18th in the pairwise standings up from 21. 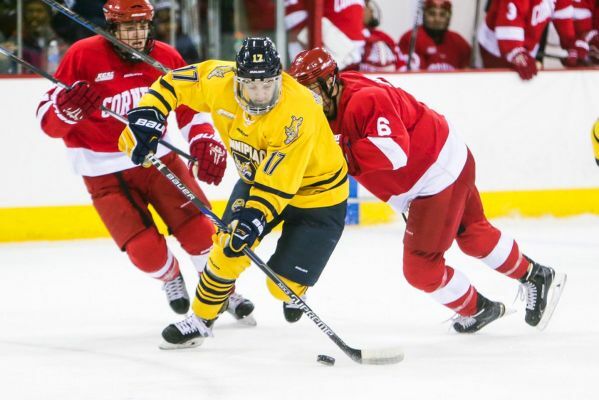 Quinnipiac returns to action next weekend when they welcome Colgate and Cornell to High Point Solutions Arena.